Chef de Cuisine, Derek Bugge. Founding Chef, Felix Penn. Frank's is the second restaurant of Sarah and Felix Penn, their first is Pair, located in the same neighborhood. In addition to oysters, the craft cocktail parlor and favorites like fried chicken and a top notch burger keep regulars coming back. The rustic-swank interior is appropriate every night but can make an occasion special as well. Unfortunately, service was slow, I think because the kitchen was slow. Food was ok but unremarkable. My cod had a gigantic dollop of aioli which was just wrong on white fish, almost felt like they were trying to hide something. The SRW menu didn’t match their regular menu exactly, prob to save money. Just felt tacky. Here’s your chance to win new diners, you should put your best foot forward. All in all lacked finesse, and that is what I was expecting for the price and marketing. I wanted to love this place but was disappointed. Might try brunch to see if that is their forte. We had a great experience celebrating a 40th bday! All 6 of us enjoyed the service and food! We look forward to returning soon. Very good food and very good service in a restaurant where one doesn't have to shout to be heard. I'll look forward to going again. We went for a late lunch and it was awesome! We all decided on the Oyster Po'Boy and it was excellent. Just the right amount of spicyness and very nice oysters. It came with a nice lightly dressed salad, and we ordered some fries to share. A perfect lunch. We enjoyed the baked oysters that paired perfectly with the rosè champagne. My only suggestion would be to add a gluten free bun for the hamburger. My husband and I love Frank's, it's a little on the pricey end but so worth it. The food is absolutely delicious neither of us have ever had anything we didn't love. Exceeded expectations across the board. Doubled down on chicken and waffles after round 1. Four yummy breakfasts plus leftovers. A casual comfortable restaurant. Great feel to this little but mighty neighborhood place. I'm looking forward to my next visit! Had a great brunch at Franks. We have eaten at Franks many times and always have had a great experience. Featured by us before all UW Football and many UW Basketball games. I love this place. 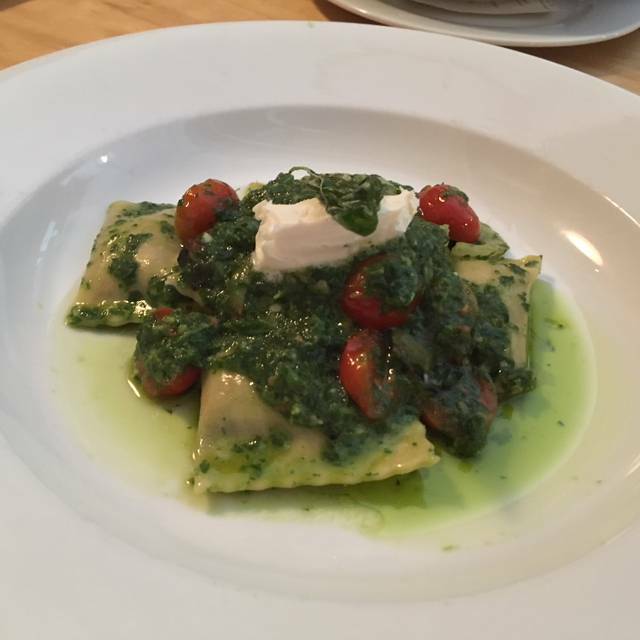 Food is yummy, cocktails are great, and atmosphere is unique for a neighborhood location. I’ve been many times, and it never fails to make me happy! The service was great, and the restaurant was super cute. We went there for Sunday Brunch and were a little disappointed. I ordered the huevos rancheros and my boyfriend ordered the Chilaquiles Verdes. Both were just okay. They were a little bland and left a lot to be desired. We heard such good reviews about the place we will try again to make sure it wasn't a one off but we were a little disappointed. Love this little neighborhood spot, always does a great business and they offer a nice mix of things on their menu. We're big fans of the small plates, which is an even better deal during happy hour. Delicious neighborhood treasure! The oysters are fantastic as are the rest of the small bites. The three of us shared many small plates and had a wonderful evening! I am a vegetarian and went with my son who had recommended the restaurant. The chef was able to make my meal entirely veggie. Cooked up some assorted vegetables with potatoes and avocado. I was really happy with my meal and grateful that they were able to accommodate me. I would like to see one or two vegetarian options on the menu so that there would be less of a fuss in ordering but the food was really good and worth the price. Great food, not-so-great service. We arrived on time for our reservation and were seated right away, but then waited 28 minutes for our drinks--two beers and a cocktail. We had to wait long periods of time between seeing our server, and even had to flag down other servers to get someone's attention. Our oysters were dumped on the table with little description, and mine were gritty. But the rest of the food was excellent--mine was one of the best burgers I've had in a long time. So a bit disappointing but hopefully we'll try again. I had a great experience. Great food and fun atmosphere! I highly recommend! Always delicious and served with a down to earth style. The brunch menu is terrific. Lots of meat but a few veggie items and adaptations are available. Try the zeppoli (fried donuts) to share. We started with oysters and they were the most delicious I can remember having. Really loved them. All our meals were delicious and our whole party was happy with what they ordered. The oysters are great. Service could have been better - for instance, I received my cocktail - ordered when first seated, during my second course. However, we were there on a Saturday so perhaps this should be expected. We loved the oysters and ordered a few small plates. Warning: small plate - means really small - not enough to two people to each have a bite. In the end, we spent $180 for a two person dinner but don't feel we had the quality of experience I'd expect for this amount. This is a monthly staple in our dining rotation. The food is always great and it’s quiet enough to have a conversation without yelling. I recommend chicken and waffles or the market Mac and cheese. Always a nice dinner. Came here for Seattle Restaurant week and had a better-than-expected meal. The highlights were the chicken 'n waffles and the cocktails. I had one called Franks Party Punch (or something like that). The chicken was perfectly fried and tasty....and the cocktail was totally delightful. Looking forward to coming for another fantastic meal. This is a very special place. 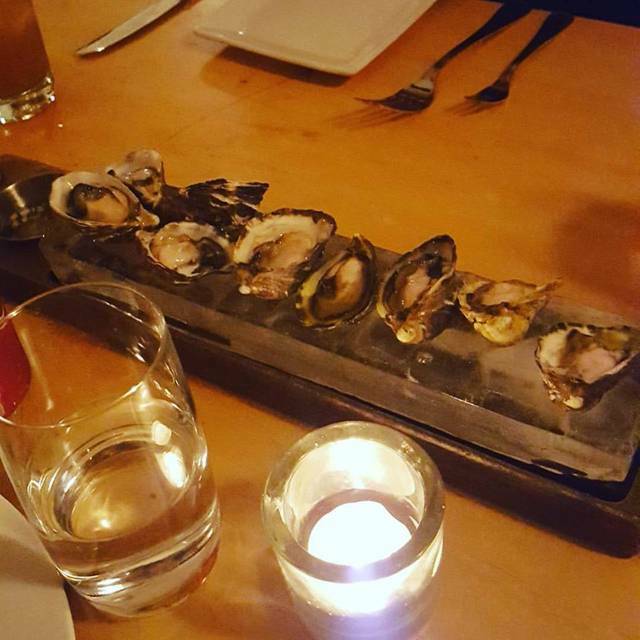 The oyster's are always fresh and served on ice blocks. We try to go often! I went to Frank’s tonight for their wonderful fried chicken. I also love their oysters on the half shell and love the presentation on blocks of ice. I am from the South and don’t get this brown gravy thing in Seattle! So asked for it to not be on the plate , came out under the chicks so sent it back. This has been my 4 th visit since April. Food consistently good , different server tonight and I’m sure if that was the problem or kitchen . So my recommendation is get no gravy or on the side it’s a large portion and nothing worse than messing up your next snack cause the chicken is not crisp from gravy!!! Went for dinner, specifically for the oysters. Got there a little before hh ended and tried a few things off each menu. The mini tacos and sliders are cute, the poutine has good flavor although lacks sizable curds. Oysters were good and fresh, they also have a good selection of other preparations besides raw. The red curry clams are good though would pair better if there was like a bowl of jasmine rice. The lobster rolls were a bit too expensive for the size. The banana split and cracker jack sundae are both fantastic desserts and a nice ending to an enjoyable experience. It was my first visit - I loved it! Great brunch menu. I can't wait to go back for dinner. Food was exceptional. Oysters from multiple different sources enabling a wide tasting platter. Small-sized portions with excellent flavor and the wine list was extensive . Great dinner topped off with a fine dessert. Definitely recommend. Our server was extremely rude and dismissive regarding a severe allergy that one of our friends had. Best part of this restaurant is the oysters otherwise we wouldn't be coming back anymore. A little expensive and that is noted that the wait staff come by frequently and push a bit on refills etc. I would have preferred their fly-bys half as often. Thanks, Pete, tall, grey hair, 67 grandpa. After a long day traveling to Seattle from Dallas and moving in eldest son to UW, we headed to Frank’s for an early dinner and made it just in time to catch the end of happy hour. We got our cocktails quickly as well as some perfect oyster sliders and mini-tacos. The poutine was enjoyed by all. We each liked our entrees (clams, shrimp, crab) and the roasted corn agnolotti was superb. We split two large desserts among four of us. The chocolate cake was ordinary but the deconstructed banana split was lovely! The decor could be called shabby chic. Service was friendly and attentive. We couldn’t have asked for a better place to go post-move in and recommend it highly for all occasions! Frank's never fails us. This time, we four split not only small plates for happy hour but a couple of entrees (mac and cheese and the agnolotti) plus a double order of steak tartare. Oh, also a salad. My only wish is that the dessert choices would change more often. Alas, we weren't wild about the blueberry mousse. Frank's had a pear dessert a few years ago that I thought was one of the best things I've ever eaten. Please, Frank's: more fruity/pastry-ish dessert choices. And maybe another one or two not so rich as the sundae and the cake. Oysters and fried chicken were excellent. Service was very slow, particularly the bartender. Restaurant seemed under-staffed. Cozy little spot with good food. My wife and I chose small plates and pleased with the food. Delicious. We had the baked oysters, which we liked the best, crab lettuce wraps and pork belly. I wouldn't go back for the lettuce wraps or pork belly. The serving size was on the small side for the price, but nicely presented. Two small dings, one is that the dining room is fairly noisy for such a small space. We initially sat at a small table in the bar area before dinner and it was quieter in there than the dining room. The other interesting thing was that we were each drinking a glass of prosecco from the bar at the dining table and when we finished, just after the first course, the waiter cleared the glasses but did not ask of we wanted refills. We found that odd. Nice small venue for intimate dinners with moderate noise and good food. One of our favorite restaurants for weekday evening dining. 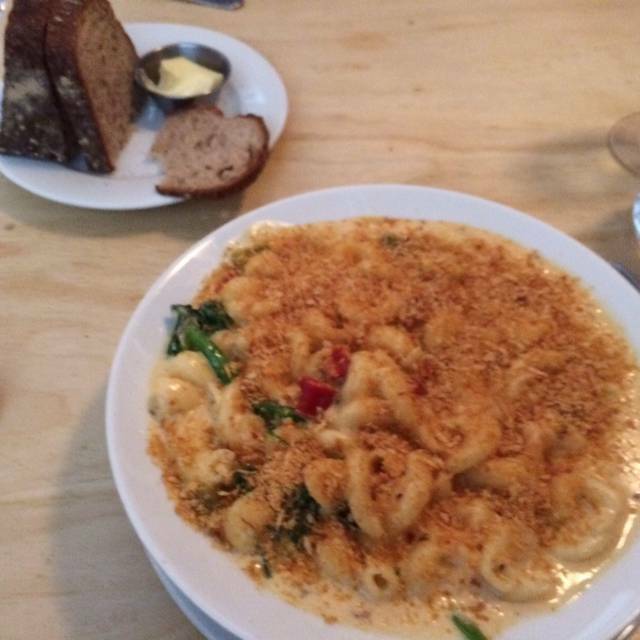 On this particular occasion we deliberately ordered a dish that we had not been happy with before -- crab mac' and cheese. New chef? Crab season? Who knows, but it was not only way better than before, but was among the best we've ever tasted. Our server, Evan, was a delight.